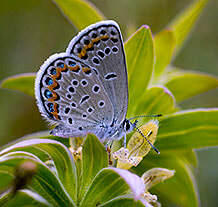 The Karner Blue Butterfly, Lycaeides melissa samuelis, was listed as a federally endangered species in December, 1992. The Karner Blue is a small butterfly with a wingspan of only 22-32 mm (Rabe). They are native to only oak savanna and pine barren ecosystems which include open canopies and sandy soil where fields of grasses and wildflowers grow, including the Wild Blue Lupine (Lupinus perennis). Oak savannas and pine barrens are scarce. Karner Blues lay their eggs twice a year on Wild Blue Lupine plants, a herbaceous perennial which is the sole food source for the caterpillars. The butterfly’s complete dependence on the lupine is one of the many reasons why the Karner Blue is endangered.